Try a whole new spin on a favorite flavor combination with our Buffalo Chicken Totchos recipe. 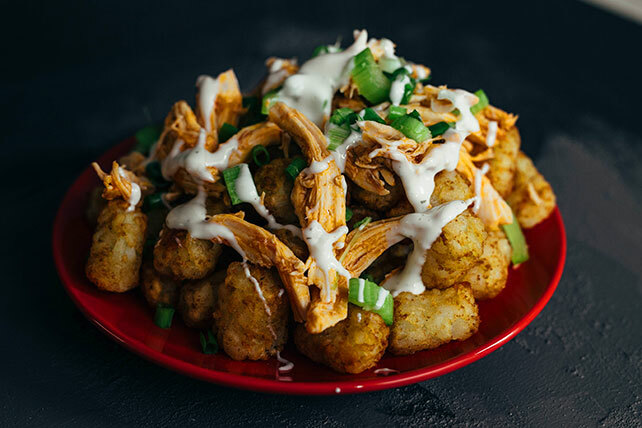 Shredded chicken coated in Buffalo wing sauce is mixed with celery and tater tots and then topped with ranch dressing to make Buffalo Chicken Totchos. What's not to love about our Buffalo Chicken Totchos? Combine chicken and wing sauce. Spread TATER TOTS onto platter; top with chicken mixture and remaining ingredients.